If you have questions not addressed in this Manual, please also check our FAQ or email info@lvl1.org. LVL1 is an open community workshop democratically operated by our membership. 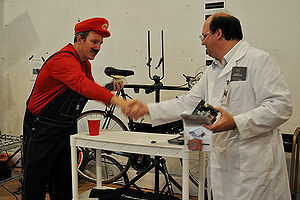 We are friendly community of tinkerers, makers, engineers, educators, scientists, artists, hackers and overall geeks. 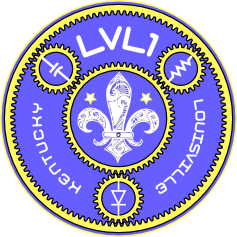 Anyone who is, aspires to be, or just wants to hang around smart, creative, friendly mad scientist maker/hacker Louisvillians is welcome at LVL1! We've got lots of cool tools and equipment. We've got a lot of really bright and creative people. 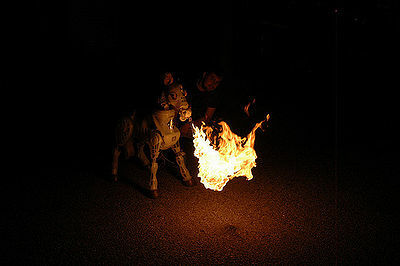 We like to work on (and show off) fun and challenging technical projects. an auxillary first aid kit is next to the light switch (on the shelf with all the safety goggles) in the woodshop. LVL1 is a dynamic space with potential hazards requiring a mature attitude towards safety. Due to the nature of this environment (and the extra precaution required) unattended minors under the age of 18 are prohibited from LVL1, except when accompanied by a legal guardian. There is a shelf in the boneyard containing free resistors, capacitors, LEDs, and some semiconductors. Items such as tape, glue, zip-ties, soldering equipment (i.e. flux, solder), hot-glue, and wiggle-eyes are also free, but are scattered throughout the space due to them move. If any parts run out, let us know by emailing Broken@lvl1.org. Wire is located on the bottom right of the soldering workstation, and is also free. Bathrooms are located just outside of lvl1's space. From the door that leads into the rest of The Pointe that is in the Main Work Area, they are just to the left. In the back (north) of the space, the Boneyard rests behind member storage shelves. Pieces that are available for hacking live in the boneyard. As we unpack from our move, asking a member or two to be sure that an item you would like to hack isn't an important not-for-hacking part hasn't accudentally ended up in the boneyard. Parking for the space is available in The Pointe's parking lots, and on the street nearby. The Pointe's main parking lot, which is on the corner of East Washington and Cabel streets, is clearly visible from the street, but another, smaller (but closer to the door) parking lot is hidden behind the flood wall off Cabel street. Check the [Location] page on our main web site for directions, photos, and more info. 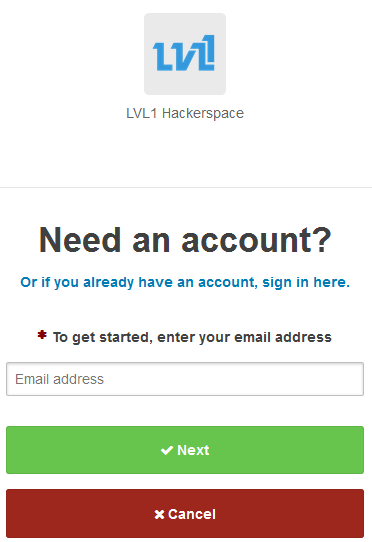 LVL1 is an open access hackerspace. Any time a member is present at the space, guests are welcome to drop by, work on projects, use the resources of the space, or just hang out. All guests must sign a Waiver. Any guests under 18 must be accompanied by a parent or guardian. When all members leave, all guests must also leave. It is the responsibility of the last person to leave to ensure that the space is empty, and the door is locked. If its your first visit to the space, sign our waiver of liability, on the kiosks in the front entry-way. Workshops are a great way to spread awareness and grow LVL1 in knowledge, expertise and memberships. They're also a great way to show off and share what you know. Hosting a workshop at LVL1 is very easy. Think of a workshop idea. Do you have any knowledge you'd like to spread? If you'd like, do an interest-check at a Tuesday meeting, or on the mailing list. Figure out how much the workshop will cost. For hardware workshops, this might be quite a bit. For software workshops, this might be nothing at all! You're more likely to get committed folks if you put a nominal price on the workshop ($5-$10), but don't feel like you have to. If you'd like, add some money on top of the workshop to benefit LVL1. Any arbitrary date will do. Find one that isn't taken on the calendar. Email the board of directors to set up an EventBrite event. Eventbrite handles payments and ticketing. If you're hosting a free or low cost workshop, you can skip this and accept payment at the door. Come to LVL1 and teach the workshop!